As we dodged filth and garbage to make way to their homes, we faced a lot of abuse from their drunken fathers, who thought we were out there to deprive them of their child’s earnings. The strength of 50 on the first day might have been only a picnic for the children, as the numbers soon dwindled to 20. The word spread and non-school going children from nearby slums started ogling The Museum School bus on the surreal road to a bright future. Starting from 20 children from 1 slum, the numbers touched 70 children from 3 slums, then 100 from 5 slums, and finally 150 from 10 slums, until our two busses could carry no more. Being a new concept, the project had to be sustained with the Founders' savings in the first year. 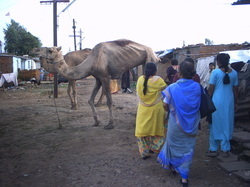 Sympathetic friends who witnessed the project from close quarters joined hands to sustain the second year. And then from somewhere Sir Dorabji Tata Trust (SDTT) came to us and agreed to support the project for 3 years. This gave us a reprieve and helped us focus all our energies on the children. In the next 3 years, The Museum School children developed themselves exponentially. Leaving rag-picking for good, joining back mainstream school, and discovering their hidden talents, they grew leaps and bounds as leaders in their community. We were so engrossed in our work, that we did not know when the 3 years flew by and SDTT support ended. Requesting them for an extension, and they agreeing to it, required one full year. We didn't have any carry over funds, and a gap year with 150 children, 15 Teachers, and 2 Busses to support, looked too humongous. A phone call from a stranger NRI Angel in UK, ended our nightmare. While he googled for innovative experiments in education, an article in Business Standard on The Museum School, caught his attention. He wanted us to replicate the model in Bangalore, and was ready to fund it for 2 years. On our request he agreed to support the Bhopal project for one year. God had played his role. While we got busy with the preparations for replication, SDTT also confirmed their support for Bhopal, for the next 3 years. The Bangalore project took off with our partners 'Bal Utsav', and was successfully executed for the next 3 years. As March 2015 drew SDTT support to a close, we were found struggling for the next funding. But this time, we did not go out with a begging bowl. Our children had proved the worth of The Museum School approach. They had made their mark in academics, arts, performing arts, vocational skills, and grew up as responsible youth and adolescents. While some of them went ahead in academics to pursue higher studies in Engineering, Science, Commerce, Arts, and Performing arts, some started their own small businesses, and some joined The Museum School as Teachers. They had also won few reality shows, and acted in few short movies too. Looking at all these achievements, Citizens came forward to support the project, by adopting a child each, and sponsoring his/her overall development (including education) at The Museum School. We wish the journey of The Museum School does not end, until the last out-of-school child in India gets educated, and becomes a responsible citizen of the country.